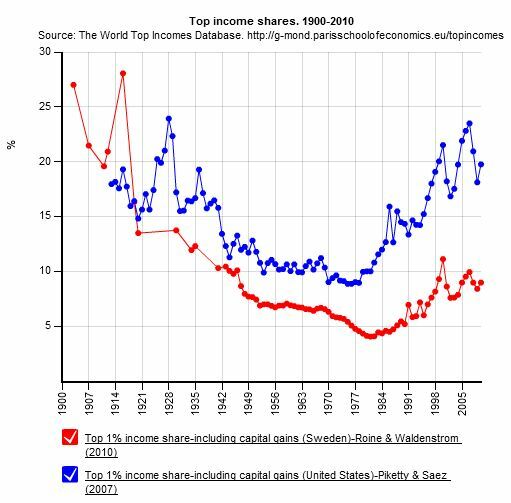 It is well-known that top income shares (e.g., top 10% share, top 1% share) have risen over the last few decades in many countries, especially the Anglo-Saxon countries. This trend is often described as follows: "the top X% have captured Y% more of the total pie", or "Y% of income gains have gone to the top X%". Such descriptions imply that there is a particular group of individuals at the top of the income distribution who are earning more and more each year relative to everyone else. As a matter of empirical fact, this is largely accurate. Yet it is not wholly accurate. Indeed, it is theoretically possible for top income shares to rise without any change in income inequality whatsoever. The first table (below) gives hypothetical incomes for 4 different women in 8 successive years. Moving from the first year to the last, Alice earns progressively more, while everyone else's income stays the same. By the end of the eighth year, Alice has a cumulative income of 36, while each of the others has a cumulative income of 8. Over the 8 years, the top 25% share of income rises from 25% to 73%. Here it would be reasonable to conclude that 100% of the income gains went to the top 25%, namely Alice. The second table (below) gives hypothetical incomes for 4 different men in 8 successive years. In this case, none of the four men earns more than the other three in more than two separate years. By the end of the eighth year, all four men have a cumulative income of 15. Yet over the 8 years, the top 25% share of income again rises from 25% to 73%. Here it would be non-sensical to say that 100% of the income gains went to the top 25%. In fact, 25% of the income gains went to each man. As noted above, the first of these two tables is closer to reality than the second. Yet it is by no means a perfect analogue to reality. In other words, intra-generational income mobility is non-zero. Auten et al. (2013, AER: Papers & Proceedings) studied intra-generational income mobility in the United States. They found that, of individuals aged 35-40 who were in the top 1% of their cohort in 1987, only 24% were still in the top 1% twenty years later. (79% were still in the highest quintile, 7% were in the fourth quintile, 4% were in the third quintile, 4% were in the second quintile, and 5% were in the first quintile.) They also found that, of individuals who were in the top 1% in any year between 1991-2005, only around 30% remained in the top 1% for all 5 following years. 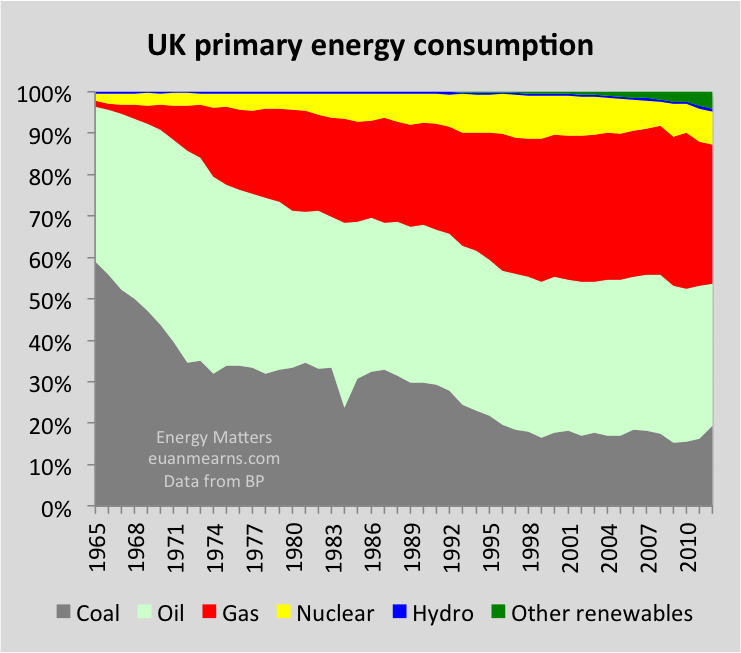 Listening to a debate about climate change, I realised I did not really know how much consumption of different energy sources has changed over timed in the US. 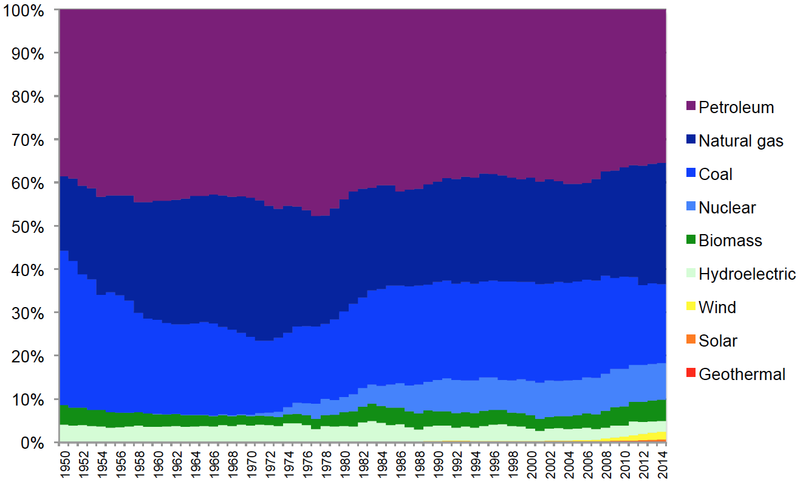 The chart below, which is based on data from the Energy Information Administration (EIA), shows the percentage distribution of US energy consumption by source from 1950-2014. I was surprised to see just how small a fraction of the total renewables continue to represent. Rounded to the nearest percentage point, for example, solar amounted to 0% of US energy consumption in 2014. 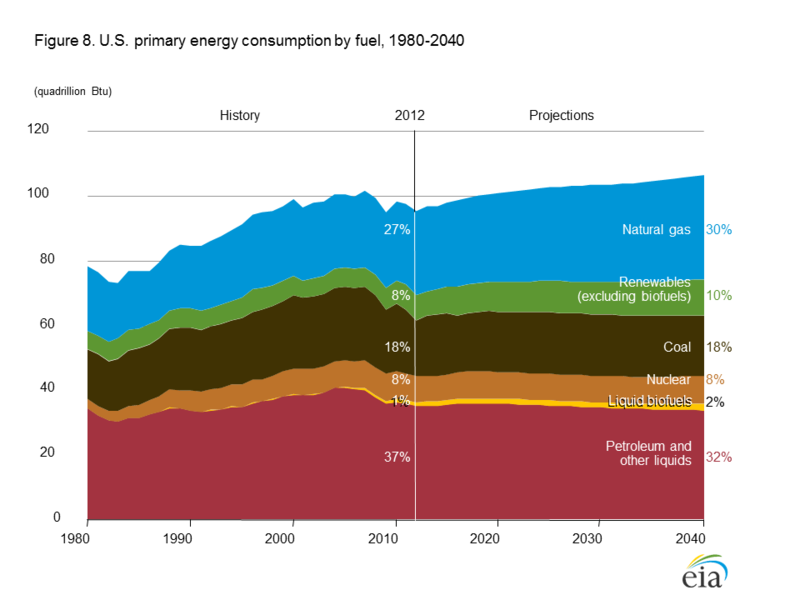 And according to the EIA, these figures are not expected to change drastically over the next few decades. 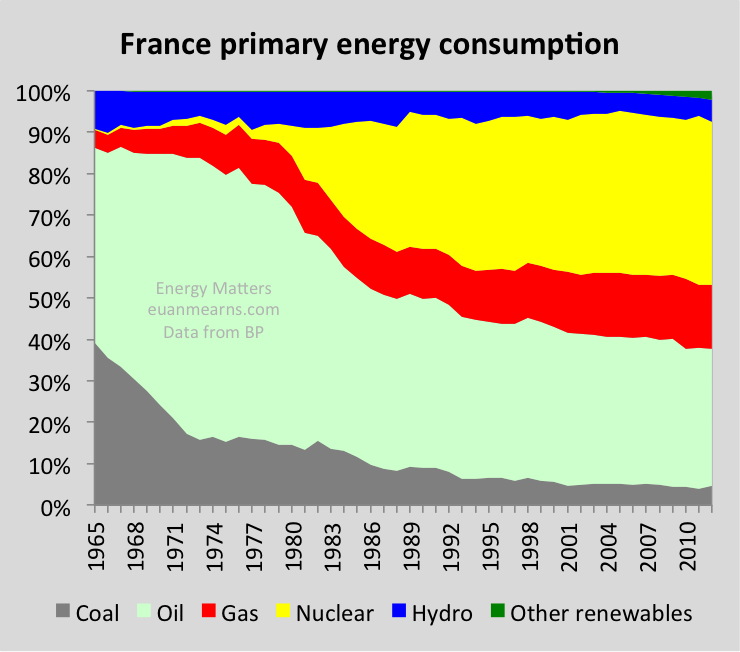 For comparison, here are similar charts for Germany, France and the UK, which I found at the blog Energy Matters. 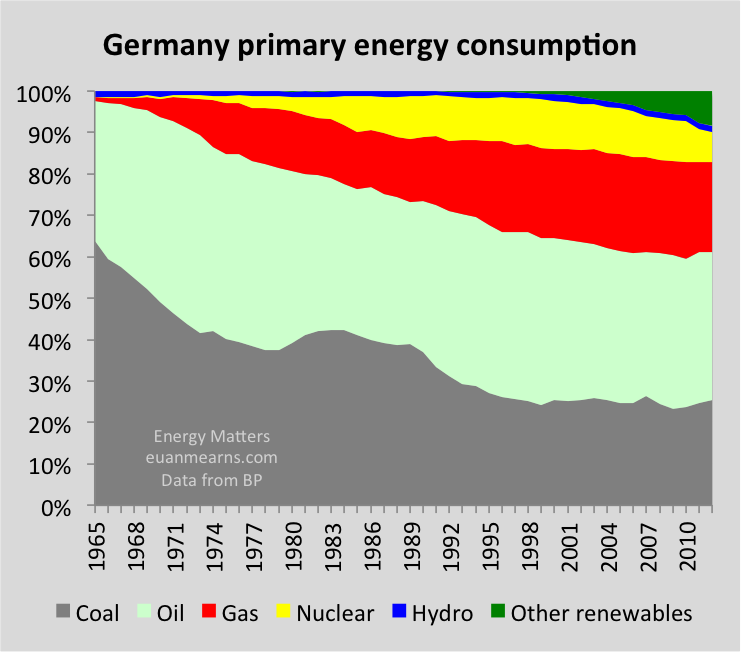 And here are pie charts for China, Russia and India, detailing recent energy consumption. As of 2012, incidentally, China, Russia, India and the US account for almost exactly half (49%) of global energy consumption.